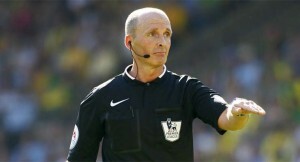 This week’s spotlight for our man in the middle falls on Mike Dean, who was appointed the referee for the Brighton & Hove Albion v Swans Premier League game on Saturday, 24th February 2018. Interesting Fact: Probably best remembered for being the referee that was cut on the head by a coin thrown by a Cardiff fan in the last ever Cardiff v Swans derby at Ninian Park and whom later went on to award the Bluebirds a last minute penalty! Let us know what you think of this referee via the comment box below.